Much of the tofu in the USA is genetically modified so it is important to look for non-gmo organic tofu. I personally like sprouted varieties the best. 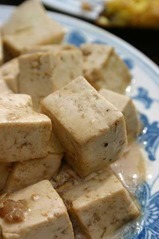 The first thing I do when I get tofu home is to throw it into a marinate and let it soak over night. I generally use soy sauce and garlic. I have tried all kinds of fancy marinades but have found that they tend to be a lot of work for a marginal benefit. So I just keep it simple. I use tofu primarily in stir fry and casseroles so I keep the preparation uncomplicated and quick. Generally I just sauté it in garlic and onions. When tofu is evenly browned take it off the stove to cool. It can then be used immediately or stored in an air tight container and used as needed. Keeps about 1 week in the fridge. So, before you give up on tofu either because you don’t like the presentation (gelatinous, colorless and tasteless) or because you don’t trust soy products, you might want to give this a try. People who assure me they “hate” tofu eat it with gusto when prepared this way. This entry was posted in Asian, GMO foods, Protein, Soy, Whole Food Plant-Based nutrition. Bookmark the permalink.